Is Your Gut Making You Fat? How gut health can affect weight. Here is yet another reason to get your gut health in order. If improved health isn’t motivation enough to eat probiotics, how about weight loss? I’ve heard the theory that gut health could be a big factor in the obesity epidemic, but I never understood why that would be. It’s simply amazing the effect those little buggers have on so many aspects of our lives. Humans are not just human, we are created as an ecosystem. Amazingly, bacteria actually outnumber human cells 10 to 1 and their effect on our health is much more complicated than many realize. The balance of bacteria that take up residence in the digestive system of an obese person compared to someone of average weight is significantly different. They have a different ratio of bacteria, and this imbalance can have an profound effect on the person. As the person loses weight, their bacteria profile changes to that of an average weight person. Questions that needs further study are whether adding specific probiotics to the diet of a person battling obesity can aid in weight loss and whether the overuse of antibiotics might be a contributing factor to the obesity epidemic. Gut health can influence your appetite and in turn your weight. A bacterium called H. pylori plays an important role in regulating stomach acids and it also regulates a peptin called gastric ghrelin. Ghrelin is elevated when you need to eat and goes down when you are full. If you don’t have H. pylori to regulate gastric ghrelin (levels of which influence your appetite) you may have high levels of ghrelin making you feel hungry all the time . I just used a lot of big words. Basically, if you don’t have the right bacteria in your stomach you can actually feel hungry when you don’t need more food. Wow! Bacteria can also effect gut health in how the bacteria digest the available food. My paraphrase: So eating the same type and amount of food, obese people would get more calories out of it. The flora found in human guts actually breaks down indigestible fiber into digestible short chain fatty acids, turning previously inaccessible energy in food into fuel. 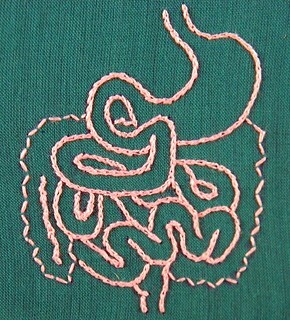 Obese people have more of the bacteria that do this conversion so they are able to harvest more energy (ie. get more calories) from food. Digestive tracks are full of a myriad of different microorganisms and altering the balance of these microbes can effects many areas of our health including obesity and weight gain. The two aspects I’ve talked about are just a couple ways gut flora can effect weight. Like all things dealing with the gut, the relationship between bacteria balance/imbalance and your health is very complex. Just the combination of these 2 ideas is a recipe for disaster. An increase in appetite coupled with getting more calories out of that food can make it difficult to maintain or lose weight. So now that you know this, what can you do? Adding probiotic to your diet either in pill form or in foods like all the yummy lactofermented foods you’ll find in my Recipe section as well as yogurt, kefir, kombucha is one of the best things you can do for your health. It’s not proven yet whether adding probiotics will aid in weight loss but it sure doesn’t hurt to try. ETA: I should note, ferments do not contain H. pylori (none that I am aware of at least). It’s mutual beneficial relationship with us just shows how complex this relationship is and may make us think twice about wiping them out with antibiotics. 4 comments to Is Your Gut Making You Fat? How gut health can affect weight. I’m guessing that the body creates the ability to digest fiber as a response to perceived starvation. This might be a result of low fat diets that have been recommended for the last 20 years. Via blogs I’ve heard of people loosing weight after going Primal or Paleo and adding grass fed animal fats back into their diets. As an N=1 data point, I’ve been overweight for about 40 years and eaten yogurt for at least 20. Last year I added kefir and kombucha to my diet. Due to illness I’m now at the heaviest I’ve ever been in my life. Also, AFAIK H. Pylori and Firmicutes aren’t normally in these cultures. That’s true that those bacteria are not in ferments (that I know of). I should have noted that.